George Canning, who appears as Britain’s foreign secretary in Napoleon in America, was a clever, ambitious and controversial politician who held important government posts during the Napoleonic Wars and aftermath. He later became the country’s shortest-serving prime minister. A skilful propagandist, Canning promoted the scathing caricatures of Napoleon that appeared in Britain at the time. 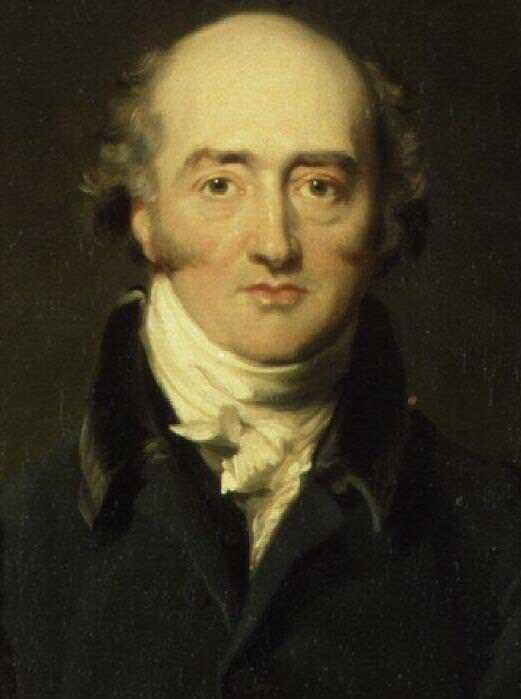 In 1809 George Canning fought a duel with the war secretary, Lord Castlereagh, which severely damaged his career. George Canning was born on April 11, 1770, in London. His father (also named George) was an impoverished Irish barrister who died on his son’s first birthday. To support herself and her toddler, Canning’s mother, Mary Ann Costello, became an actress. After an unsuccessful London debut, she took work in provincial theatres. Mary Ann may or may not have married a disreputable actor and theatre manager named Samuel Reddish. In any case, she bore him five children, including two sets of twins. When Reddish became insane, Mary Ann married another actor and had five more children. By this time young George Canning had been made the ward of a wealthy uncle. He was sent to Eton College and Christ Church, Oxford. Canning was acutely aware of his modest beginnings and his mother’s lack of fitness for respectable society. Surrounded by the sons of the aristocracy, he sought to prove himself their equal or better. Canning was an exact contemporary and classmate of Robert Banks Jenkinson, who – as Lord Liverpool – in 1812 became Britain’s prime minister. Though George Canning lacked Liverpool’s breeding, he too had political ambitions and the brains to see them fulfilled. Trained as a lawyer, he became a Member of Parliament at the age of 23, under the patronage of Tory Prime Minister William Pitt the Younger. A skilled orator and writer, Canning gained influence within Pitt’s camp and rose rapidly. British Tars, towing the Danish Fleet into Harbour; the Broadbottom Leviathan trying to swamp Billy’s old-Boat, & the little Corsican tottering on the Clouds of Ambition. Caricature by James Gillray, 1807. George Canning, roguish and alert, sits and tows. Napoleon dances over the flames in a thwarted rage. Killing no Murder, or a New Ministerial way of settling the affairs of the Nation! 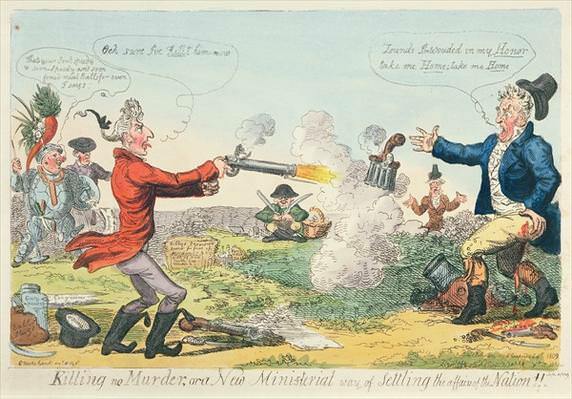 Caricature by Isaac Cruikshank of the 1809 duel between Lord Castlereagh (left) and George Canning (right). Upon returning to Britain in 1816, Canning became president of the Board of Control (the India Office of the period). In 1820, he resigned, ostensibly over King George IV’s attempt to divorce Queen Caroline, to whom Canning had been a friend, advisor and possibly lover, but also because he was out of sympathy with the government’s policies regarding Europe. He also, perhaps, did not want to be associated with an unpopular government. Three days later, Dorothea wrote that Canning was dissatisfied with the King’s grudging letter offering him the Foreign Office. After the 1822 Congress of Verona, Britain declined to take part in any further European Congresses. Canning boasted that he had broken up the Congress system and thereby frustrated the ambitions of the continental powers. Wellington thought that Canning was trying to destroy the alliance on which the peace of Europe depended. 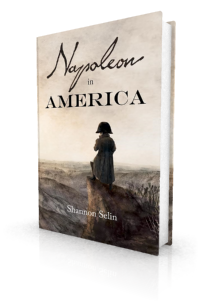 As is clear when Canning spars with Wellington at Dorothea Lieven’s dinner party in Napoleon in America, Canning opposed the 1823 French invasion of Spain. He was also determined to keep France out of Spain’s Latin American colonies, which had revolted against Spanish rule. Canning argued that the best security against France taking over Spain’s colonies was for Britain to recognize their independence. This involved him in major arguments with his colleagues, most of whom did not want to go that far. Cabinet gave in only when Canning threatened to resign if the new republics were not recognized. On July 8, 1800, George Canning married an intelligent and spirited woman named Joan Scott. She came with aristocratic relations and a fortune of some hundred thousand pounds, which should have put to rest Canning’s fears about finances and fitness for high society. Still, he did not allow his mother to meet his wife until 1804, by which time he and Joan had three children: George (born in 1801), William (1802) and Harriet (1804). Their fourth child, Charles, was born in 1812. For a snapshot of Canning at a dinner party, see my post about how he introduced the 20 Questions game to America. On April 10, 1827, George IV asked Canning to form a government. The Duke of Wellington, as well as Sir Robert Peel and five other members of Liverpool’s cabinet, declined to serve under Canning. Many other Tories joined them in opposition. Canning was obliged to form a coalition of liberal Tories and conservative Whigs. He initiated a program of progressive reforms, but was not able to see them through. Already ill when he took office, George Canning died at Chiswick House in London on August 8, 1827, of inflammation of the liver. He was 57 years old. Huge crowds attended his funeral at Westminster Abbey, where he was buried. To read George Canning’s last words, click here. See M.D. George, “Pictorial Propaganda, 1793-1815: Gillray and Canning,” History, Vol. 31, No. 113 (March 1946), pp. 9-25. Charles Duke Yonge, The Life and Administration of Robert Banks, Second Earl of Liverpool, (London, 1868), p. 295. Peter Quennell, ed., The Private Letters of Princess Lieven to Prince Metternich, 1820-1826 (New York, 1938), p. 206. Charles William Vane, Correspondence, Despatches, and Other Papers of Viscount Castlereagh, Third Series, Vol. 4 (London, 1853), pp. 56-57. Leveson Gower, Letters of Harriet Countess Granville, 1810-1845, Vol. I (London, 1894), p. 151. The Private Letters of Princess Lieven to Prince Metternich, 1820-1826, p. 320. James Fenimore Cooper, Recollections of Europe, Vol. 1 (London, 1847), pp. 209-210. Louis J. Jennings, ed., The Correspondence and Diaries of the Late Right Honourable John Wilson Croker, Vol. I (London, 1885), p. 268. Superb work Shannon. Keep it up. Thanks, Alfonso. 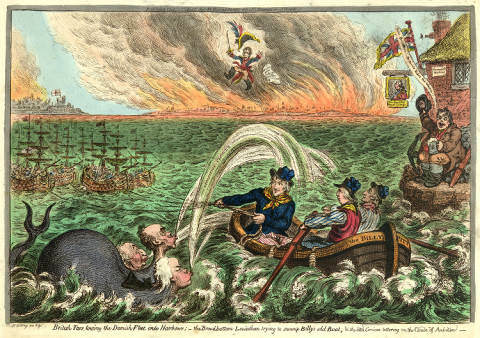 Your wonderful presentation on Gillray’s political caricatures at the Napoleonic Historical Society conference in Toronto was excellent inspiration. Excellent piece! I must say Canning is a fascinating figure. My main caveat is that he didn’t intrigue against Castlereagh because of Walcheren — the plotting began in February or March, and was the culmination of a variety of issues Canning had with Castlereagh, mostly springing from his handling of the Convention of Cintra of 1808 and his refusal to recall or censure Arthur Wellesley. Of course it was the Walcheren failure that caused all Canning ‘ s plotting to come out into the open. Thanks, Jacqueline! It’s great to learn more about the background leading up to the famous duel. The Opposition hates him, the King loathes him; the Ministers distrust him; those who want him do not like him. His personal following is a mere drop in the ocean; and, with that exception, there is not a soul in the United Kingdom who has the slightest respect for him.